One must factor in that the anti-slip tape application is not merely dependent on the air temperature but the mainly on the surface temperature, this is what it is will adhere on to. One possible solution is to raise the surface temperature prior to adhesion, this can be achieved with the use of heat guns etc. Once correctly applied the temperature can safely vary without any problems within certain parameters. 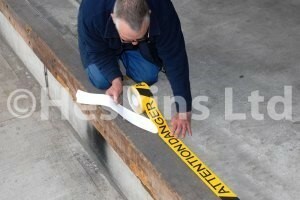 For example, our H3401N black standard anti slip tape can happily cope with temperatures between -30°C and up to +70°C. If a customer requires higher temperatures there are alternatives; H3406 is highly temperature resistant (being metal foil based). Different plastics and adhesives can be used. Or alternatively fill out the contact us form and a member of Heskins sales team will get back to you.